Travel to Norway and neighboring countries with an expert from Go Norland. Visit unique places. Immerse yourself in Norwegian culture. An unforgettable experience. I just finished a double batch of Verdens Beste Kake, Norway’s newest traditional cake that is frequently made for celebrations. It’s November and it seems as though I find myself baking more during these two coming months than the rest of the year. It’s cold outside and the smells in the home bring comfort and warmth. As I am baking, my mind begins to travel back in time to my own family, here and in Norway. Bringing out the old Norsk cookbooks and family recipes, a story erupting with each one. Today, as I make this most delicious cake, my Pappa comes to my thoughts. Traditionally, the second Sunday of November is Father’s Day in Norway, Finland, Iceland, and Sweden. It’s traditional to do a little extra for fathers on this day, maybe to serve breakfast in bed, take him out to dinner, sending a special card or just taking the day to celebrate a father. But, how would you address the card in Norway? Til Far or til Pappa? Typically named Farsdag, there is some question if it should be called Farsdag or Pappasdag? Language research also found out that there are differences in how boys and girls call their parents. More women than men use “mamma” and “pappa”. Young girls use “mamma” more than boys who use “mor”, and young boys use “far” more frequently than “pappa”. Much like that in USA, we use mom and dad, mother and father, mommy and daddy, in many similar ways, some more outdated from child to adult, and different spans of time. Father’s day was first celebrated here in the USA in 1909. In Norway they began to celebrate Farsdag after WWII. So, today, if we began this tradition, what would we call this day?... Papa’s Day, Father’s day, Dad’s Day? Well, this second Sunday in November I celebrated my “Pappa” by remembering and reminiscing all of the wonderful ‘Norsk’ he weaved into my life. KJÆRE PAPPA, DU VAR VERDENS BESTE! Tradition!! Not for the 'now' experience and feeling, but saving for a future date, be it a holiday, fest, or just to give us that warm feeling of a past memory to keep us going, to ponder on and enjoy. We hear a song, it elicits a memory. When we eat certain foods, it brings to memory a time from the past. When a new season begins, all of the seasonal memories come to mind. Every time I bake a cake, my grandson is so excited. "Who's Birthday is it Bestemor?" he asks. It is a memory of a time of celebration for him. 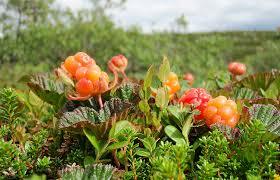 When I think of Tyttebær (Lingonberries), Multer (Cloud berries), Cantareller (chanterelle mushrooms), moss, Lyng (Heather), støvler (my blue Norwegian rubber boots), and more, it draws me to the mountains (fjell) in Norway. Up to the mountain family cabin where we spent our summers and more, picking berries, hiking over the mountains, and in the quiet, listening to the music from the wind, and from the sheep and goats in the distance. In the early morning we would be woken by their bells clanging, waiting impatiently for their daily dose of course salt treats on the big white rock. Autumn colors paint a beautiful fall display for our memory bank to stir up later in the cold months to come and invite us in after the warmth of summer. We pick Tyttebær, placing it in the freezer to be pulled out at various times in the future to make Trollkrem, Bløtekake, or just with sugar added, for the holidays. My cousin just picked her dose of Multer. She's placing them in the freezer to be brought out at Christmas time. I pick Lyng to place in the home to dry, reminding me of my memorable times in the mountains. A work out gives us a feeling of accomplishment, creating.....Memories for the future. When Facebook, Twitter, Pinterest.....are all locked up, I go to my memory bank with the vivid colors, smells, tastes, and experiences I have had in the mountains. I have been creating and gathering memories from the past that I can and will experience later....Tradition! A warm feeling, sending out the cold memories, bringing in the warm, colorful, and sensational ones. Now, that is longtime, continuous fulfillment! Hiking in the mountiains with my Helly Hansen Rubber boots. Up in the mountains in Norway where the goats and sheep graze, here enjoying a stop for salt. I have often wondered why Norwegians use hearts for so many different ways. Hearts on doors. Hearts in every department in the stores! In the homes. On the outside of the home. Carved in churches and old buildings. Even in the WC. Then there is the conclusion of a letter...Hjertelig hilsen or heart full of greeting, and Hjertelig Velkommen or with heartfelt welcome. And, hjertelig takk, or, heartful of thanks. Hearts in photos using the outdoors, with the hands in the sun...And then of course, making sweet heart waffles! I have asked a few Norwegians themselves what makes the heart so important? And not a love symbol or sexual innuendo as so many see it for. Most of the answers they have are unknown or they hadn't really thought about it. It must be something that just comes from the heart (no pun intended). Maybe it is because the weather can be so cold and the heart is a warm place to linger either by thought or kinship. Gathering warmth with heart decor brings in the warmth and sunshine to a room. Remembering good warm times with a gathering of friends and family maybe? Hearts remind us that we are loved and thought of. Maybe its an optimistic way of bringing in the good to our homes and lives. There is a company called Hjerte.com based out of Son, Norway. All they do is create and make heart jewelry. I use Norge mitt hjerte, fjord og fjell tur, or Norway in my heart fjord and mountain tour to as a way of showing you the very special place in my heart that Norway means to me. I am so very grateful to have been raised in this beautiful country! So i leave you with an ongoing thought......what does a heart mean to you? And , how will you now use it? Today i visited my almost 95 year-old mother, along with my daughter and grand-daughter. Four generations of beautiful women in a photo opportune. It was an emotional time for me. My mother does not speak much anymore, she has a quiet, sweet disposition with her dementia. But I know deep in her soul, she's aware. Her eyes widen as I sing to her, 'Her kommer dine arme små', and 'Jeg er så glad hver Jule kveld'. A few months ago she sang with me, but now she is quiet. A little bit of Heaven has come down today as I ponder on the memories of Christmastime as a child in Norway. All white, glistening with snow, singing a solo in our children's choir that my mother led at the American Lutheran church in Oslo, shopping in Karl Johan with for family presents. I remember having to take a nap on Little Christmas Eve, the 23rd, and the center doors to the living room were closed. When we woke, the tree had been decorated and dressed in our best we would have the fanciest dinner at my great aunt and uncles home. Of course, the Julenisse came on Christmas Eve for a visit. Here in the states, my mother carried out our Norsk traditions. The 7 traditional cookies were made with fine detail and both my mother and father made them together. Lutefisk was a big part of our dinner, and singing around the Christmas tree and reading Jesus' birth story before we were to open the presents, one by one. I could go on and on, and Im sure you could as well. Stirring up memories of my Norwegian family, on earth and in Heaven, it brings to my mind many traditions that I now carry on with my own family, and I know will be passed down generations to come. Its like the chains that we make at Christmas time, loop to loop intertwining around the tree. Heaven came down to earth today, and glory filled my soul. In the moment, "My name is Terry." Time together, 500 meters underground. I had a repeat traveler write this quote on a post travel note to me. She has now been on two of my tours. There were also two others that came again on my tour as well. I was humbled with gratitude and wonder when they signed up to come. Living a distance away in our big USA and not having the times to revisit past travelers, it is always a joyful moment to reconnect, widen and deepen relationships and friendships, no longer just tourists, but real people with stories to share about their life. I had a past traveler that was a little uncertain about her unknown roommate she would have on a tour I led. After the tour, they were already planning a trip to Europe together the next year! A grandmother took her granddaughter to Norway, and for the first time introduced the whole Norwegian family to her granddaughter, and they spent the day with them and the cousins. What joy the grandmother expressed to have the opportunity with her granddaughter. She has now passed her legacy on to her granddaughter who is cherishing those times they had together. I could go on and on with wonderful memorable stories, traveler sayings, and experiences that I have personally had with the travelers that come on my tours, but it wouldn’t be a blog, but a book unfinished. The mountains become bigger and sharper, the water in the Fjords mirror the mountains, the food tastes better, and the narrow, winding roads aren’t as scary, swimming in the fjord isn’t so unbearably cold, the noise in the bus is a good hum, the bus driver keeps us laughing and comfortable. "On the road of life, it’s not where you go but who you’re with that makes the difference!" In a few days I will be going home, then in six weeks I'll be going home again. Home in Norway and home in the US. When I was 12 years old, apparently I had to make the decision as to what nationality I wanted to keep. Of course my mother made the decision for me to become a U.S. citizen. I was born in Norway at Ullevål hospital in Oslo. I also had my tonsils out there and I can even remember it. At that time, the hospitals were overly sterile and I only had white walls and floors to look at. Even the saucy porridge I ate was white. Alone at 10 years old, it felt like a grown-up experience, as my parents were not allowed to stay with me. My childhood memories bring me back to singing in the Norwegian Kringkasting girls choir. It is a vivid memory. Just to think that at the age of eight years old, I had to get there and back by bus in the late afternoon and evening all by myself. The big highlight of the choir was that we were on television one Saturday. In those days, this was rare. Coming to the U.S. when I was just 12 years of age seeing the big Statue of Liberty and our big Oslo-fjord cruiser boat anchoring in the gigantic New York harbor, one can only imagine how my eyes were big with excitement. Especially when our new car, a summer blue Oldsmobile station wagon was waiting for us. I remember at the store, my sisters and I were given Lifesaver rolls for candy. There was no reason at this point to even comprehend the decision of nationality......until this day. Here in Norway is where my history lies–my nationality is strong, my heritage and memories run deep within the walls of this family cabin–now my home away from home. I have bought a cabin by the Oslo Fjord! You've likely read that Norway is voted one of the most beautiful places in the world. It also gets high marks for best places to live. I have no question in my mind to these statements being true. Many people are gravitating to this country to visit, explore, live, work and indulge in its overall beauty. I am even tempted to move there for a few months out of the year myself.